Everything on this site is mine unless otherwise credited. All artwork unless specifically stated is © me. At this time of year, people start sending out ‘round robins’. My mum has sent one every year for as long as I can remember and almost certainly for much longer than that. Over the years they’ve changed – no longer does she write a long letter about the family, where we’ve been and what we’ve been doing – these days the family members get 2 paragraphs at the top of 4 tightly packed pages. Her life has changed now, and it is very happily centred around her life in religious community, and that’s fine. Mair and I are living our own happy lives. So Mair wrote her own Christmas letter – “but who wants to read it?” “I do!” I said. We went to the Brecons for Easter, and I dragged Pete up all the hills we could see. After a summer of cricket and martial arts, he then dragged me up Ben Nevis on a cold cloudy showery day in August. “But there won’t be a view from the top” – there wasn’t. But there was a stunning view on the way back down, to make up for it. We saw the Edinburgh Military Tattoo, and looked for Nessie in Loch Ness. Pete took up Swedish after making a number of Swedish friends in Taize. I learnt how to say hello, good bye, and thankyou! I’ve been up to London any number of times, and visited as many friends as I could while I was at it. We’ve seen family in Edinburgh, Greenock, Leeds, Hambleton, Lincoln, Wales, Bristol, and anywhere else we could catch up with them. Back to the beginning of 2009, and the year started with a resolution – to make this the year we sorted out our emigration to Australia. Well, the paperwork is in, and the wait is continuing. However, we can’t speed it up. In February I took an exam to prove that I speak fluent English (I needed the points). In May we were told we should apply for WA state sponsorship, and in July the application was finally submitted. If we’re lucky, we’ll be there by Christmas 2010. I took a dancing exam in April, and 5 more this Christmas, and am hopefully now well on the way to being a qualified dance teacher with the ISTD (if I pass them – results are pending! ), and have had to thank my husband (and other friends, to a lesser extent) many times for putting up with my constant refrain of ‘I can’t, I’ve got dancing!’. In the middle of it all, we’ve found time to keep up with all our friends. Several close friends have got engaged this year (weddings galore in 2010), there have been theatre trips and birthday parties, dinners out, barbecues, Singstar, the Balloon festival, and of course Ruth and Michael’s wedding, to name but a few outings. Pete has taken up Wing Tsun, and tap, and rejoined a 5-a-side team when he changed jobs in August. We’re both working close to home now, and enjoy not having to drive every day. He’s enjoying working for a charity where he’s able to get out – still not as much as he might like, but it’s nice that he can get out of the office and go and fix things in the regional offices and houses. He’s been to Old Trafford and Edgbaston, as well as smaller venues such as Westbury Town, and we went to see some Twenty20 matches at the Gloucestershire County Ground. 2010 – a new decade. My sister suggested I wrote a round-up of the decade. I saw 2000 in by passing my driving test, and my A-levels, and going to the Sydney Olympics. I hope to see 2010 in by qualifying as a dance teacher, visiting all my friends in the USA, and finally moving to Australia with Pete to settle there, as I dance my way out of the 2000s. I’m excited to see what the year brings. The rest of the decade, in one paragraph: 2001, I went to university, and I got engaged. 2002, I changed courses, and we moved into Mr House. 2003, I started working part-time at the after-school club, took Pete to Nice, and then took him to Australia for my 21st birthday. 2004, I went to Paris with the Erasmus scheme. 2005, I came back from Paris, and went to Australia for Christmas. 2006, my mum went into a convent, I graduated, and got married, and had my first trip to Taize. 2007, Pete graduated, and I changed jobs to work at Best Practice, and drove to Taize with Mair and Cath. 2008, the summer of weddings! 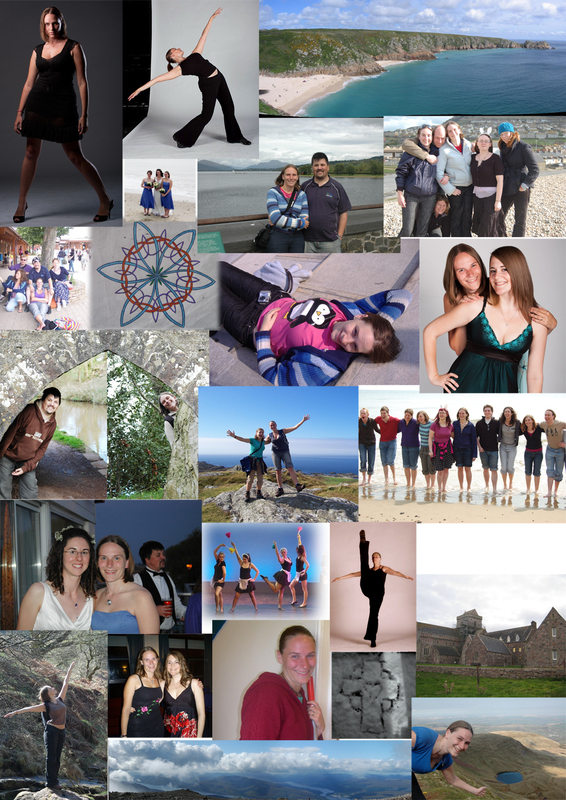 Finally, 2009, dancing, dancing, friends, travel, and some more dancing. It’s been a good decade.